More Than A Game | Joined by WWP CEO Lt. Gen. (ret) Michael Linnington, a group of warriors and families found out on Super Bowl LI weekend that some of the Super Bowl fun takes place before the big game. 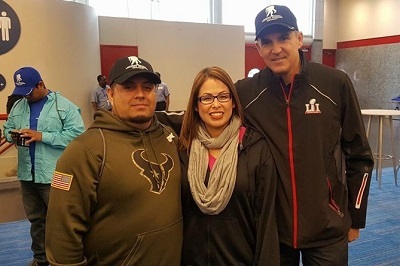 Houston's NFL Experience Lounge connected veterans and families for an ultimate fan experience that offered something for every age, team, and level of fandom. A host of interactive stations at the lounge treated guests to the world of an NFL gladiator: a 40-yard dash and vertical jump against the league's best on LED screens, a display with an up close look at Super Bowl bling, personalized digital keepsakes, and more! Football is a deeply rooted American tradition that has united families and a nation for decades, in the name of showing passion for another extraordinary kind of warrior. In his latest Huffington Post piece, WWP Physical Health and Wellness director James Herrera offers a glimpse into why this passion holds a particular appeal for veterans -- and how it bonds them -- no matter where they are in the world. For more images of warriors making connections at NFL Experience, head over to our Multimedia page!